Ailsby Collection: Leader’s Bodyguard – Lijfwacht v. d. Leider Honour Pin. Leader’s Bodyguard – Lijfwacht v. d. Leider Honour Pin. Leader’s Bodyguard – Lijfwacht v. d. Leider Honour Pin - Obverse. Leader’s Bodyguard – Lijfwacht v. d. Leider Honour Pin - Reverse. This badge comprises of a small diamond shaped badge that measures 25 mm high by 15 mm wide with edges that are shamphered. It is produced in silver. 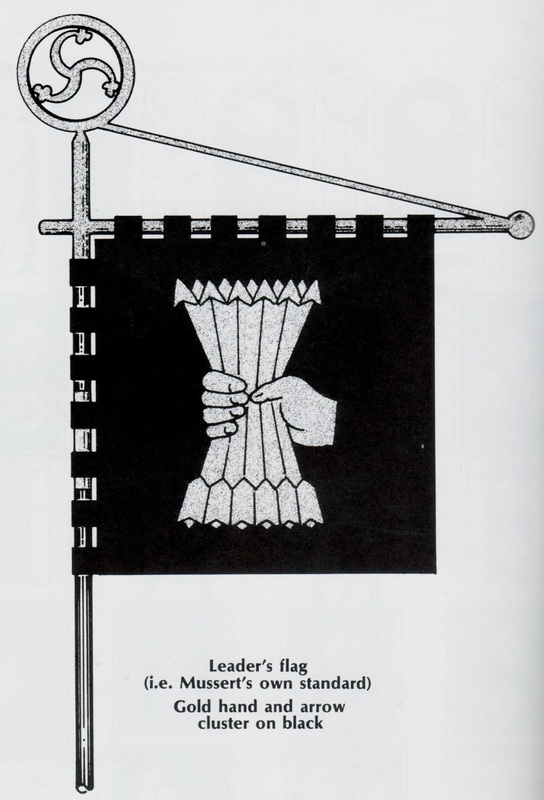 On to this at the centre is a small Leader’s emblem, the hand with the arrows. This produced in extremely high definition and gold plated. 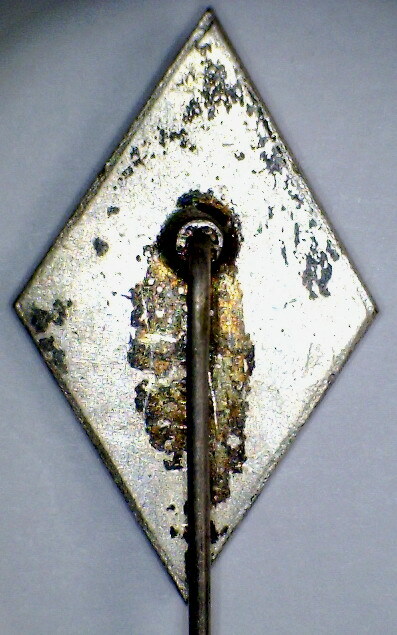 The reverse is flat with no markings. On the upper segment of the diamond is a small raised receptacle that houses the pin. The purpose of this award is unknown, but can be suggested that it was an Honour award given for service in the Leaders Body Guard. As yet this is the only known example. Leader’s Bodyguard – Lijfwacht v. d. Leider. In August 1939 a “Mussert Garde” was formed from selected W. A. men to act as personal bodyguard to the Party Leader. 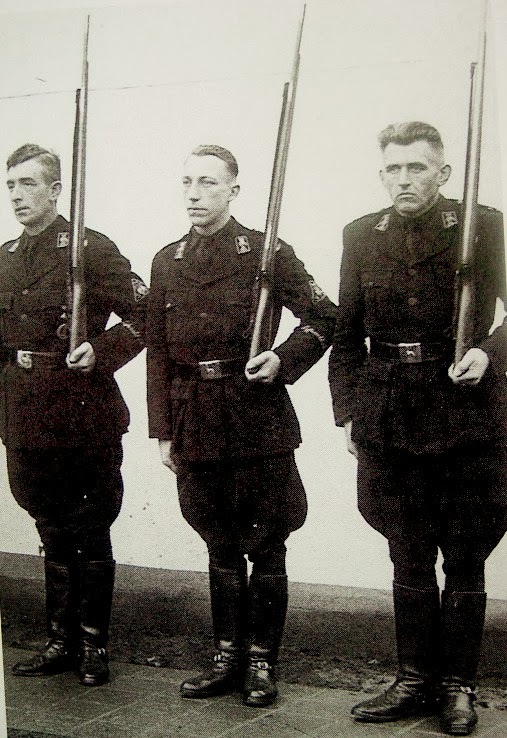 It was disbanded in 1940 but reformed after the German occupation under the name Lijfwacht v. d. Leider, Bodyguard of the Leader. 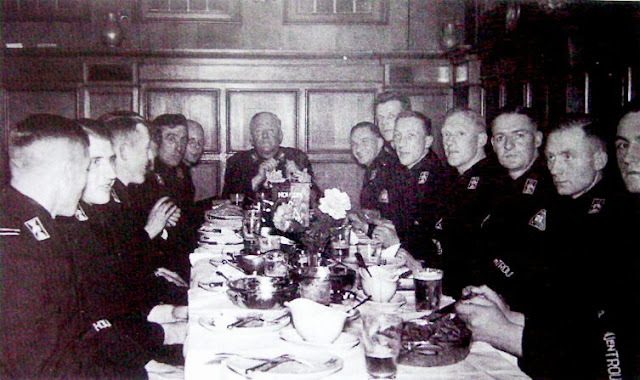 Like the rest of the Para – military bodies of the N. S. B. it wore an all-black uniform. At first there were a modest eight ranks, the highest being only Captain, but later this was expanded to thirteen with the new rank insignia closely modelled on that of the SS, being worn on the left collar patch, gold on black. On the right collar patch the Leader’s emblem, the hand with the arrows was worn. 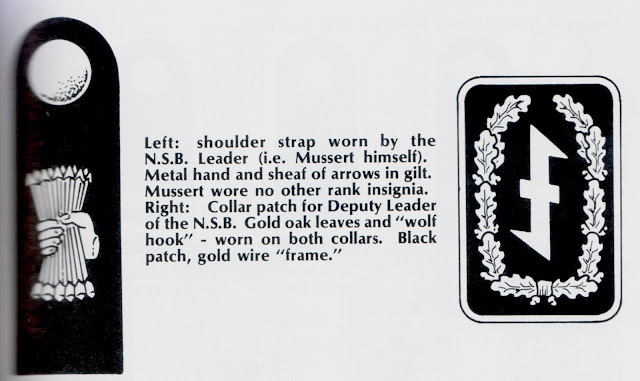 This applied to all ranks except the three lowest which had the Leader’s emblem on both collars. 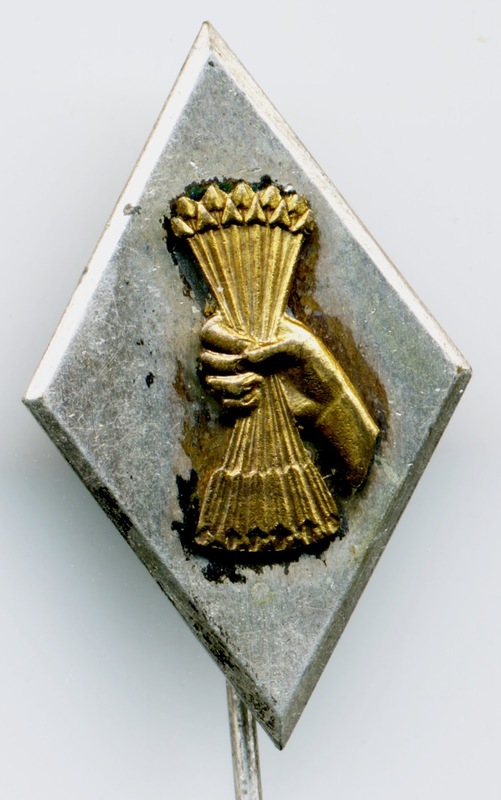 This same emblem featured as a belt buckle and as the lower half of the cap badge set. The upper part, only worn by officers, was the lion rampant in gilt. Cuff titles: Lijfwacht v. d. Leider; Lijfwacht Mussert and Overste Mussert, each is gold lettering on black, exists and were worn at different periods. Zondervan A.J. - Commandant of the W.A.with Mussert not the Leaders Pennant on the car. 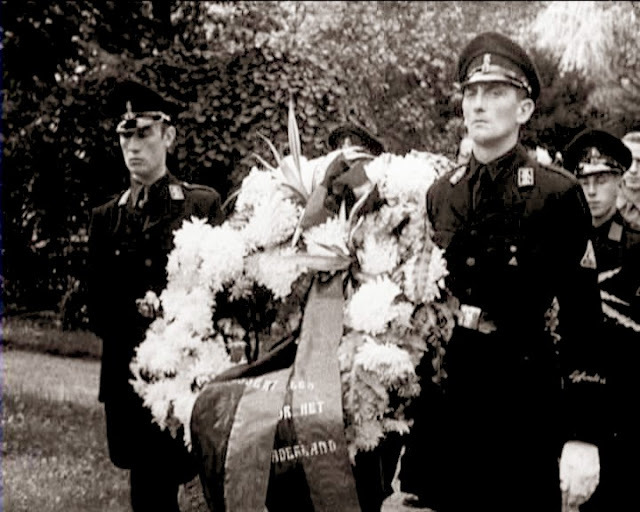 Leader’s Bodyguard – Lijfwacht v. d. Leider wearing the NSB Five Years Service Badge . 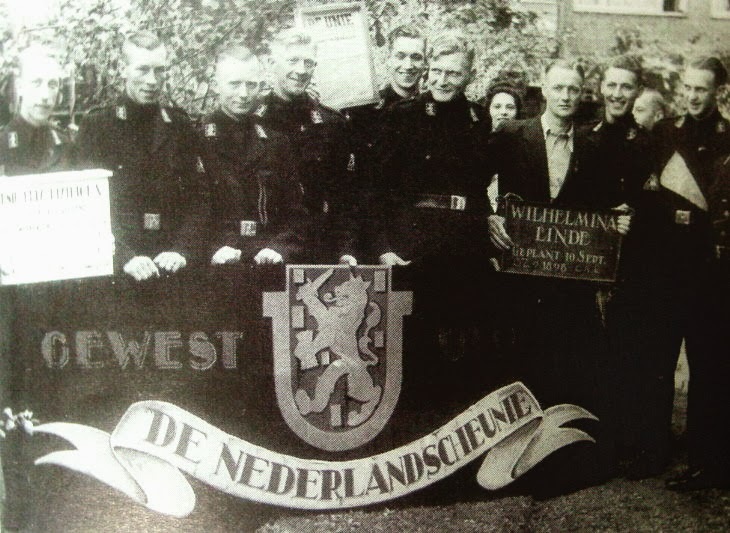 Leader’s Bodyguard – Lijfwacht v. d. Leider - DE NEDERLANDSCHEUNIE. 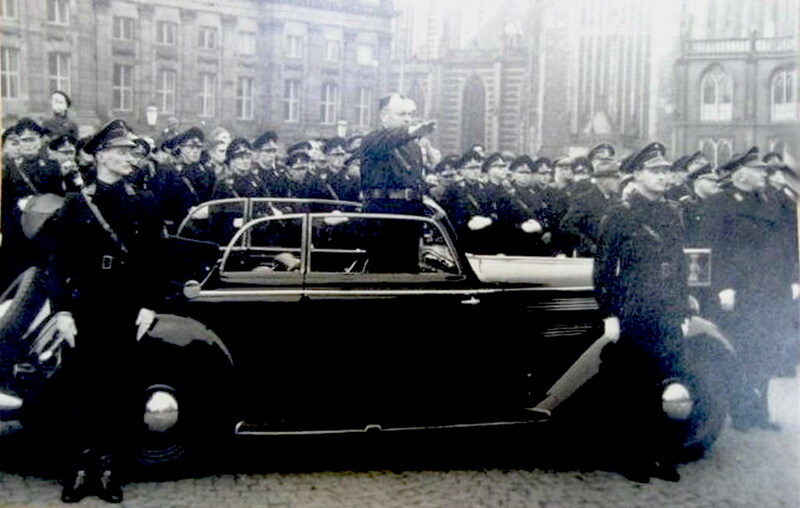 Leader’s Bodyguard – Lijfwacht v. d. Leider on Guard.